Winter is clinging to life tenaciously in Melbourne. I don’t expect to be preparing soup in October! With a fresh batch of chicken stock in the freezer it was the first ingredient that sprang to mind when the mercury plummeted yet again. A week of intensive, hands on, school holiday grandparenting had left the larder stripped bare and my energy sapped but with a few simple stock items I was able to prepare this delicious soup to help restore our stamina. Bring the stock to the boil and season well with salt and pepper. Add the rice, stir once, then cover and simmer for 10 minutes. Add the chicken meat to the stock and simmer for another 5 minutes. Remove the pot from the heat. In a bowl, whisk the eggs with the lemon juice then slowly whisk in a couple of ladles full of hot stock. Do this slowly to avoid cooking the egg, then slowly pour the egg mixture into the hot stock, stirring constantly. Return the pot to the stove and gently reheat, stirring constantly. Do not allow the soup to boil. Serve immediately. Oh wow! This sounds heavenly. I have heard of this Greek soup before but never had it. I think I remember a version similar using Lamb. I love Greek food! 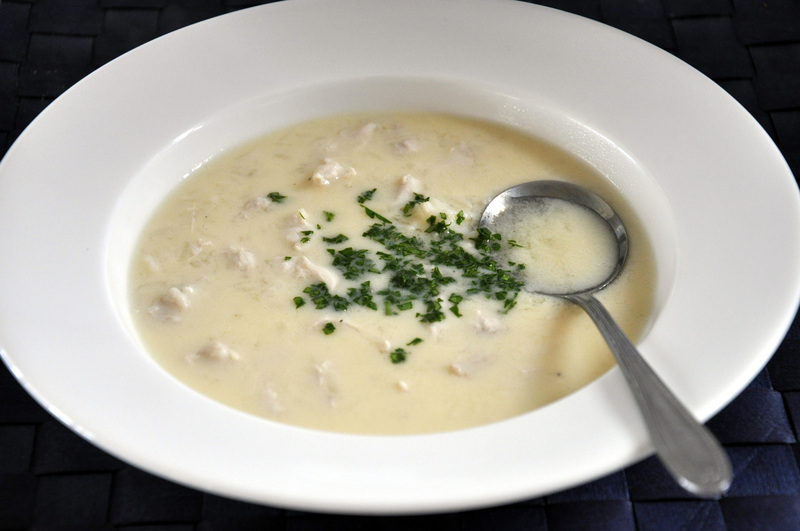 This entry was posted on October 1, 2012 by ladyredspecs in Chicken dishes, FODMAP diet, Food, Gluten Free, Light Savoury Dishes, Soup and tagged chicken soup, easy, egg, lemon, quick.